We’ll be celebrating our 75th Anniversary on Sunday 25th May with a club ride and a barbecue afterwards at Roydon Village Hall. Club ride will leave Diss at 9am heading out to Breckland Lodge (the destination of the first ever club ride back in 1939). We’ll then have a coffee break and loop back to Roydon Village Hall in two groups – with one group covering 75km and one covering 75miles. There will then be a barbecue at Roydon Village Hall at 1:30pm. Everybody welcome plus partners. It would be great to get along as many people associated with the club through our 75 years as possible so please spread the word! Come and join us on a choice of routes around the picturesque lanes of Norfolk and Suffolk. No need to book, just turn up on the day and ride! Redgrave circuit: Centre of Redgrave, Near Crosskeys P.H. Wortham Ling circuit: At eastern end of Wortham Ling, by made-up track leading to ‘Anglia Autoflow’. Entry Fee : £2 – registration on the day. Course : Dove Hill, off A143 opposite turning to B1062 turning – meet in the car park at The Dove public house. The plan was hatched back in November last year. Fresh, or rather, enthusiastic, from the Tour Ride, London Paris and Surrey Hills Sportive I put a call out for Diss Members to get on their bikes and explore new parts of the country. 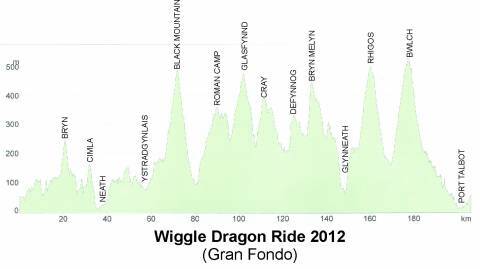 Consequently, as you know, a big group took on the Cheshire Cat back in March which was to prove a stepping stone for the big one – The Dragon Ride 206km and 3350m of climbs. 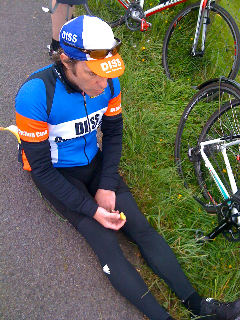 Sadly, Mike Farrington was unable to join us (It was his idea to take on the Gran Fondo route, thanks Mike! ), so Andy Smith and I awoke on the Dragon weekend to find that West Wales was being washed away and we were in the grip of some the worst summer weather imaginable. What on earth were we going to find in Wales? Would it be on? Would we be blown off a mountain never to be seen again? We packed up the Land Rover and decided to find out. It was a lads weekend away after all! Amazingly we got to our hotel just outside Cardiff in around four hours, arrived in sunshine and promptly walked into the village to find some Brains and a bite to eat. 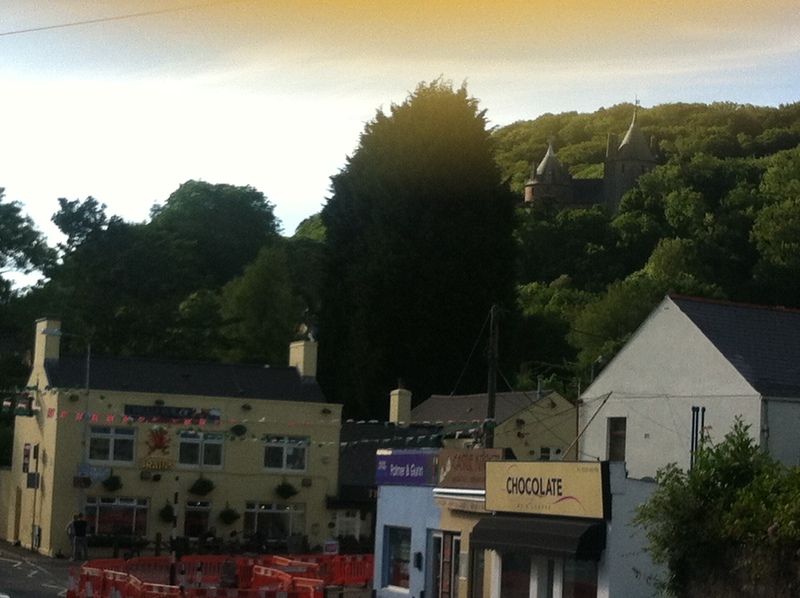 Of all the sights we didn’t expect to see was a ‘Chateau’ sitting above the village on the hillside. The marketing material said this ride was as close to the Etape as you could find in the UK. We had just walked into another world! Due to our early start, 6’o’clock alarms, breakfast options were restricted to McDonalds so fuelled with an egg McMuffin and coffee (?) we headed off to Margam Park. Cloudy, a bit of drizzle and little wind was to be the order of the day. We timed our arrival just right before the traffic was backed down the M4. Around 4000 participants were expected and it was starting to show. The first big decision of the day was what to wear. We two girls blouses held a fashion show at the back of the Disco (that’s the vehicle to the uninitiated) putting on, taking off, does my bum look big in this before settling for the days attire a process made easier for me as being half asleep and in the dark left my winter boots and box of glasses in the hotel room! After attempting to make best of the facilities (some nifty pissoirs but no loo roll anywhere all day – poor Andy) we joined the next batch of riders to be set off by Sky Rider Matt Crampton. No sooner had we left the park the roads seemed to be coated in treacle. What seemed to be flat was deceptively uphill. How on earth were we going to finish the route? At least at this early stage there were lots of riders (we set off in a group of around 125 to start with) and we soon got into a bit of rhythm. All was well and it seemed just another Sunday morning Club Run until we turned off the High Street in Maesteg. Left at the lights took us onto the bottom of the first jaw dropping climb, a straight steep incline. Think approach to Mow Cop. This started to sort people out and those around us started to change. The cycle of climb and descent had begun. We whistled down the other side though, past the Ambulance with a rider on a stretcher with neck brace(!) round the bend (he hadn’t made) and onto the next one. A bit of urban riding ensued before another Mow Cop killer, short and sharp and then general ups and downs to the first Feedstation. This, being available to all three routes was mayhem but we stocked up on fluids, bananas and interestingly cooked new potatoes with skins on and covered in salt. Alas, no loo roll! Now it started to get interesting. We headed into a non descript village (I didn’t have a clue where we were having completely lost my bearings) before turning off the main street (there was a trend developing here) onto another incline. This took us over a Cattle Grid and onto Black Mountain. We did a number of Cattle Grids and until Sunday I had never jumped one on a bike, or anything else to that matter, but with a little incline in front it didn’t take much to get aerborn. The long steady incline (we were down to around 7-8mph) was alpine in style and was our first taste of snaking rural roads. At the top we regrouped only to be told that “You don’t find hills like that in Norfolk”. We had been spotted by a couple from Cambridge. “Weren’t you on the Norwich 100?” they asked. They had remembered the Diss CC Thin Blue Line zipping past them on that hot, sunny, flat(!) (Stop! – Ed). Diss CC was being noticed. Moreover, we passed a few Iceni Velo people too! Nice. By this time we were getting into the middle third of the ride. ‘Alpine’ descending was followed by another alpine climb including a very picturesque agricultural area of hedged meadows all looking extremely green and lush. It seemed everyone around us was asking “Where is the next feedstation?” It was on a hillside, along a main road with a panoramic view of the hills. Thank God it wasn’t windy or raining more than it did as with the final two positions the gazebos would have been blown who knows where. No cosy Village Halls for us! The final stretch contained the two (really? 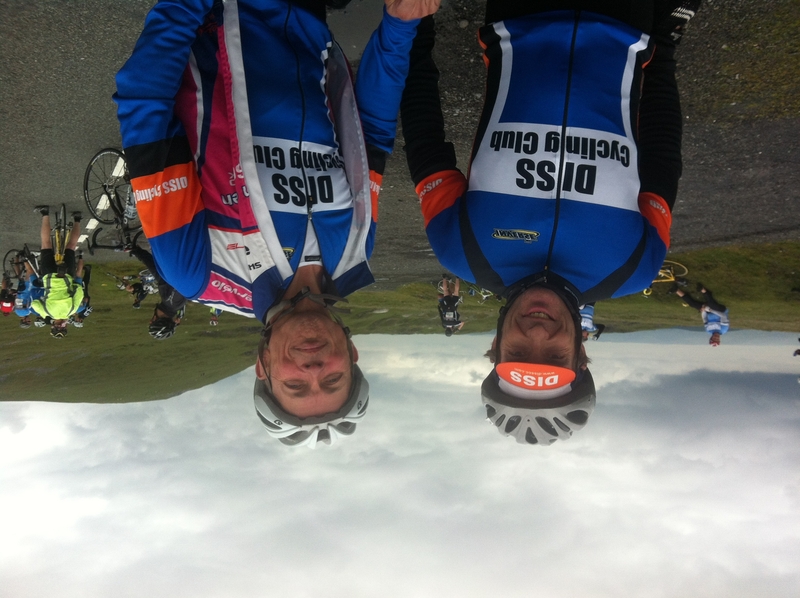 – Ed) most serious climbs namely Rhigos and Bwlch. Both are featured in 100 Best Climbs. They are in the classic Alpine mould with twisting hairpin turns and precipitous edges but boy, did we come down them. I clocked 46mph somewhere along the route, freewheeling. We had to slow for one or two of the tight turns but others you could see straight through and just had to tuck down behind the bars and hurtled into the next town or village at the bottom. What caught us out was that we had thought we had completed the last climb of the day only to be faced with the best of the day – Bwlch. A comfort break was needed halfway up Bwlch and a Motorcycle outrider stopped too. “You’re from Norfolk” (adopt a Welsh accent – Ed), “My wife is from Kenninghall”! Once again we found what a small world it is and how rewarding it is to travel around with our Club jersey. We were in his ‘backyard’ and had a good chat with him. After hitting a flat spot midway (well me anyway) we both seemed to finish strongly and gave a tow to a couple of other guys as we headed back to Margam Park, just outside Port Talbot 131.6 miles and 8557 calories later. We averaged 14.8mph overall which we felt was respectable given that we were in alien territory and were there with the intention of completing rather than killing ourselves. The ride time was 8hrs 53 with an official time for us both (we made a point of crossing the line together) of 10.38.13. All in all we had a cracking time. The weather was actually perfect, the event seemed to us well organised with outriders, Mavic support and excellent signage and the scenery was breathtaking (or was it the exertion). We would certainly recommend it. Now for the L’etape! Another succesful Sportive completed. 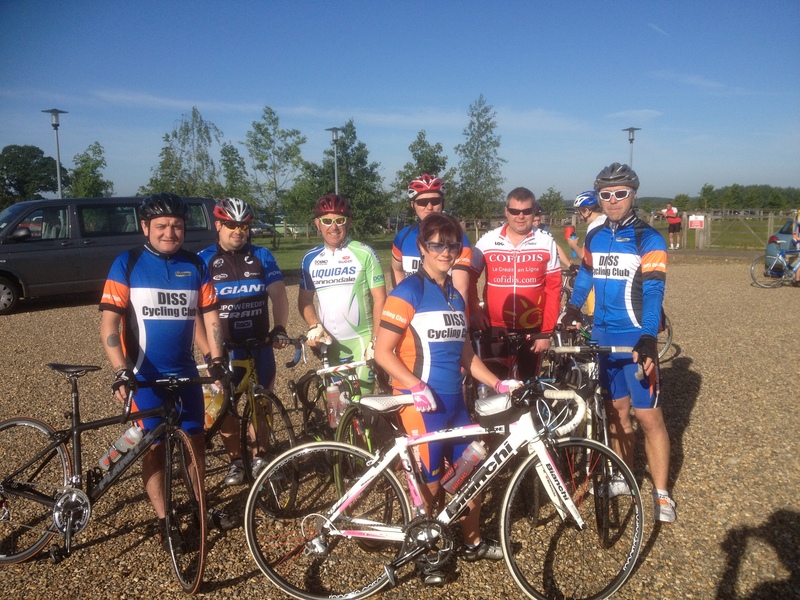 On Sunday 10th June we woke to perfect weather conditions for a cycling event. Readying ourselves for the short drive to the venue we were full of excitement at the prospect of an enjoyable days cycling with like-minded people. Arriving at the World Horse Welfare Centre at Snetterton we met up with fellow Club members, collected our goodie bags, free food and timing chip and then gathered around the start line ready for the off. Away we went with a klic klic klic as everyone clipped into their pedals. Setting off from the start we were joined by a friendly group of Thetford MTB riders having a go at some tarmac for a change, swapping stories of our Dusk till Dawn experiences we soon covered the first 15 miles and with the warm ups compete our steady pace was now topping the 20mph mark! Needless to say the group started to fragment and I found myself riding 50 revs and off with a couple of Thetford MTB lads to try to get back to the bunch. Entering Swaffham we caught the main group and then rode with them through the challenging ups and down before reaching the first feed station at Great Massingham. Refreshed and regrouped we headed off north again navigating our way through the lanes to Docking and on into NW Norfolk. After conquering more of the rolling countryside we were soon greeted by a great view of the North Norfolk coastline over Holme and Brancaster. Heading down into Thornham we turned left onto the coast road and soon left again to start heading back. A few more miles of undulating lanes and the infamous concrete road and we headed into East Rudham for our second and final stop. After topping up on food and drink we set off on the final leg, ‘only another 35 miles’ shouted one of our group encouragingly! Slightly easier lanes followed towards Weasenham and Litcham then onto Bradenham through Shipdham and Scoulton and into Shropham for the final and inevitable sprint for the line. 500 meters to go and we were caught by a couple more of the Diss CC members who had ‘given us a head start’ ha ha. Crossing the finish line together we congratulated each other on another enjoyable ride before heading for the cafe to claim our well-earned free pasta meal and drink. Congratulation to Ken and all his team of helpers and volunteers who gave up so much of their time to host such a well run event. Well done. Firstly many thanks to Dawn (and her mum and dad), Andy Smith and Val Bolger for the fantastic range of home-made refreshments on offer to all those of us who took part in the club charity ride to Dunwich today. Andy had devised a very scenic route to the coast and occasionally there was even time to admire the beautiful landscape as we made our way to the coast. 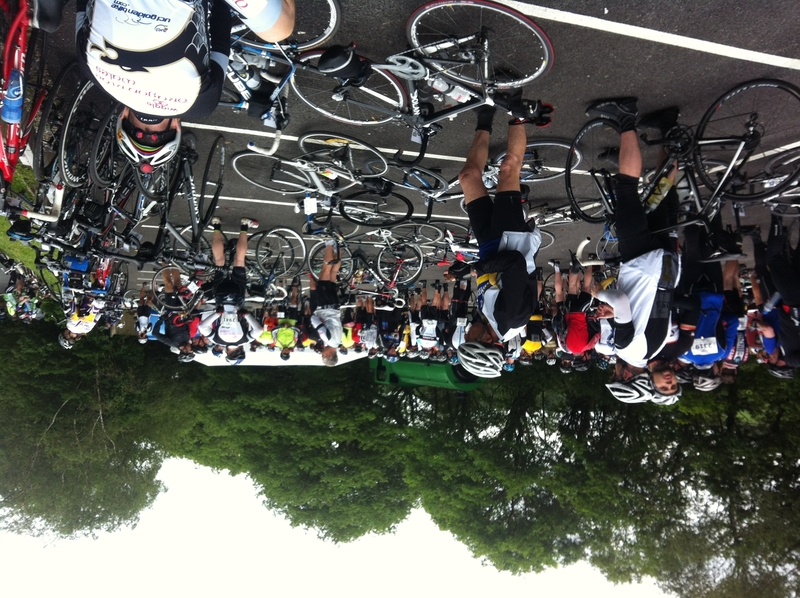 We had 23 riders out today which was a great response for a very worthy cause. It was good to see two of our female members navigating their own way to Dunwich (albeit with a slight detour). We also had two teenage riders out for their first ride with the club, they both did exceptionally well to stay with the group and no doubt they will be leading us off the front in a few weeks. Dawn and Andy would like to extend their sincere thanks for raising a total of £237 for Macmillan Cancer Support and who knows this might well be the start of an annual charity event. Many thanks to all who participated and donated today. With the summer’s sporting successes still fresh in the nation’s memory, racing cyclists in the eastern region have an exciting new circuit racing venue confirmed for 2013 to help motivate them through the long dark months of winter training. Working in conjunction with British Cycling, Lord Iveagh of Elveden Estate has agreed to allow access onto a 5km tarmac circuit in the heart of the Estate for a series of early season road racing events starting in March 2013 and running through until the end of June. The feel of the circuit is unique in road and circuit racing terms. Set in a mixture of mature woodland and arable farmland and completely hidden from public roads and buildings it offers an entirely new concept in closed circuit racing – the feel of a road race with the accessibility and flexibility of circuit racing. The race day programme will include events for all categories of rider and will provide a superb stepping stone for those looking to gain experience in bunch racing as well as offering something new for more experienced racers. (The events have been registered with British Cycling and have been listed as road races to allow greater flexibility when setting the event category and thus the banding for licence points). Anyone wishing for further information about the proposals for Elveden should contact saraflatt@britishcycling.org.uk.